Savvy Spending: Free Thank You For Your Service Movie Ticket for Veterans at AMC theaters! Today only! 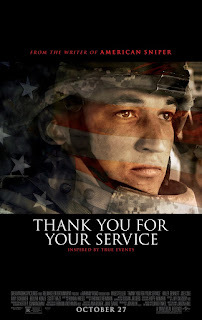 Free Thank You For Your Service Movie Ticket for Veterans at AMC theaters! Today only! Today, October 26th only at 7PM, U.S. Veterans and Active Military Members can receive FREE admission to the movie Thank You For Your Service at participating AMC Theaters. Only 25 free Service Member tickets will be given out at participating theaters and these tickets are available on a first come first served basis. Go here to locate a participating AMC Theater near you.